This is one of our favorite recipes! Great for the summer as a light meal or as a side dish year-round. Make this all at once or partially prepare ahead of time. I don’t recommend cutting the avocado up ahead of time because it gets slimy within a day. 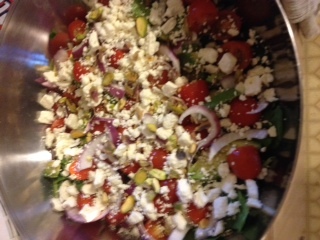 But you can chop up the red onion, pistachios and tomatoes the night before for easy assembly the next day.